Home InspirationWeddings	What to Expect from an Indian wedding? Throughout India there are many subcultures which range from region to region, therefore, it is important to keep in mind that one might find different takes on a typical Hindu Marriage. All in all there are basics characteristics that are found at any Hindu Wedding Ceremony. The celebration lasts for days, and no matter where the family is in the world they, will all be there; it is an extremely significant event within any Indian family. There are several pre-ceremony events that take place, like the engagement and the holy bathing, but let’s talk about the actual ceremony part. First, the bride’s parents wash the groom’s feet treating him as a Lord, and then offer their daughter as a gift to him. Then the groom will tie thread to the bride’s neck three times, representing three gods, the creator, continuer and destructor. Then both the bride and groom take seven steps around a fire together while reciting several mantras (Hindu prayers). The bride and groom will then take vows that state that they will be together their entire life no matter what, and during these vows, the brides hand is in the groom’s hand. Afterwards, the tying of the knot takes place, which literally involves tying, and that is the tying of the bottom of the brides Sari (traditional dress) and the upper garment of the groom. This signifies the strong bond between the newly wed couple. Then the father of the bride asks the groom to be with his daughter for the rest of his life, and to support her religiously, morally, financially, earthly and finally eternally. Then unbroken rice which is mixed in turmeric is sprinkled on the bride’s and groom’s head. The turmeric represents gold and the unbroken rice parallels rice flourishing with a flourishing marriage. Then there is an exchange of garlands, representing communication between the newly weds. There is a reception afterwards with entertainment, food and beverage. All guests and participants wear very bright colors; the bride traditionally must wear red. 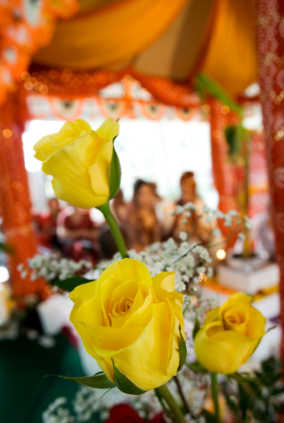 Flowers are all over any Indian wedding, they represent the beauty of unity. Mostly roses and the dispersing of rose petals is the typical flower to adorn any Indian wedding.